I’m of the opinion that we don’t see the imagery of 9/11 often enough – it seems relegated to once a year. But THIS is not what I had in mind. The quote was from remarks she made at a March 23 banquet hosted by the Council on American-Islamic Relations (CAIR). Her description of 9/11 as “some people did something” has now caused a firestorm. There’s been a full-throated reaction from both sides of the aisle. But others faulted the NYPost. I think that her words, at best, were poorly chosen. Never should anyone, much less a member of Congress minimize Sept 11th by saying “that some people did something”. Better that in making a point about civil liberties, she had correctly noted that terrorists motivated by a distorted image of their faith killed 3,000 innocent Americans. I can understand why she might have been uncomfortable using the words radical Islam in front of an Islamic group. CAIR doubled in size after 9/11 because they recognized that in the aftermath of the most despicable and heinous terrorist attack on our country perpetrated by radical Islam, law abiding, peace loving Muslims were losing access to our civil liberties. After I said that on SiriusXM Radio, a friend pointed out that she was being held to a different standard because she’s Muslim. And it made me think. 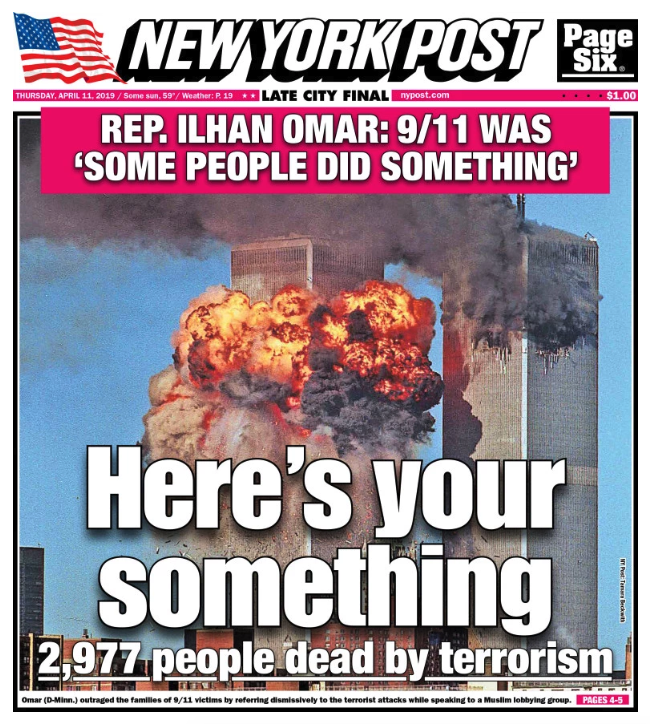 What if it had been a different type of political leader who similarly sought to make representative Omar’s point about the diminution of civil liberties post 9/11? That’s a Libertarian mantra – so what if a Libertarian leader, say Ron Paul, was speaking at an affinity group, say, CATO, and similarly said: “some people did something” that caused the rest of us to lose our civil liberties. Would he have faced the same reaction as Congresswoman Omar? Bottom line – her words were totally in appropriate – and so too was much of the reaction.